Patrick Ness is a genius. Prentisstown isn’t like other towns. Everyone can hear everyone else’s thoughts in an overwhelming, never-ending stream of Noise. Just a month away from the birthday that will make him a Man, Todd and his dog, Manchee – whose thoughts Todd can hear to, whether he wants to or not – stumble upon an area of complete silence. They find that in a town where privacy is impossible, something terrible had been hidden – a secret so awful that Todd and Manchee must run for their lives. But how do you escape when your pursuers can hear your every thought? 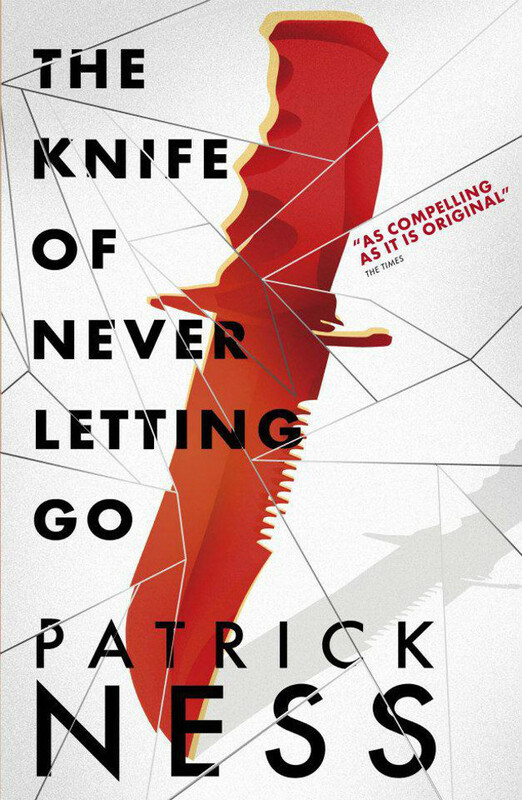 The Knife of Never Letting Go is unlike anything I’ve ever read before, and I’d expect nothing less from the incredible brain inside Patrick Ness’s head. It’s a blend of dystopian and sci-fi, but neither of those genres can really describe such a unique book. I started off reading this book out loud to my boyfriend (much to his annoyance while he was playing a video game, I should add). It was completely unintentional, but I think it really helped me get to grips with the writing style of this novel, and why Patrick Ness made the decision to write with such a strong and unfamiliar dialect. I immediately knew what Todd sounded like, and how different his world is to mine. It does take a bit of adjustment, but I soon realised that actually, it’s genius. It’s a stream of consciousness with grammar and spelling that has you reading it in the exact way Todd’s thinking it, and therefore the exact way his Noise sounds to everyone around him. I’m pretty sure there are page-long sentences in this novel at times, but somehow, it works. I often found myself forgetting the significance of Noise until a character responded to something I’d been reading as internal dialogue rather than speech, because of course, they can hear Todd’s thoughts too. This is a very, very cleverly written book. That’s not to say I sailed through this book without hitting a rock or two. This book is filled with LOTS of travelling and journeying, and sometimes it can get a little slow. I also felt like the secrets, which were painstakingly extracted from various characters but not always shared with the reader despite the first person narrative, were not as much as a big deal as I’d hoped they’d be. I couldn’t stop reading, because I wanted to know what on Earth (or whichever bloomin’ planet they’re on) was so bad Todd had to run away from Prentisstown whilst being chased down by an evil army that kills everyone in sight. But when I actually did find out the secrets I was thinking… that’s it? That’s really it? Plus, I’m not sure I can forgive Patrick Ness for some of the heart-breaking scenes in this book that I won’t talk about because it’ll spoil the whole thing if you haven’t already read it. But I will say this: WHY IS IT SO EASY FOR CHARACTERS WE LOVE TO DIE, BUT SO DAMN HARD TO KILL THE BADDIES?! Talking of characters, there were a few that I really liked but felt we hardly got to know. With Todd constantly on the move, as soon as we begin to find out details about a character, we leave them behind. Whether they’ll make a reappearance in book two (The Ask and the Answer) or book three (Monsters and Men) I don’t know, but I sure do hope so. I managed to pick up books two and three of this series at a Walker Books event I went to recently (which you can find out more about in my vlog here), so they’re high on my TBR list after reading The Knife of Never Letting Go. Have you read The Knife of Never Letting Go? What did you think of it? I’d love to hear your thoughts. If you’ve reviewed it on your blog or on BookTube leave me a link! I’d also love to read your reviews of other Patrick Ness novels (did you know there’s a new one in the works ahead of a 2015 release? YAY!). You can read my review of Patrick Ness’s More Than This here. Previous Post November Book Haul 2014, plus first ever vlog! Brilliant, isn’t it! One of my favourite books. Interested to hear what you think of the rest of the series. 28-year-old blogger & journo. Proud nerd, YA reader, Potterhead and Disney fan.